BIG CAPACITY 1 Litre capacity for greater number of uses.DOUBLE ACTION Detergent and degreasing action.QUICK CLEANING Removes stains quickly and effectively.BIODEGRADABLE Safe for the environment. BIG CAPACITY 1 Litre capacity for greater number of uses.NONIONIC SURFACTANTS Quickly takes off dirt with a solution that eliminates it while rinsing.QUICK CLEANING Removes stains quickly and effectively.GLOSSY FINISH Dries without leaving a trace. ANTI RUST AND CORROSION High protection.WATERPROOF Excellent resistance to water, mud or weathering.STRONG ADHERENCE Strong adhesion power for fewer uses. 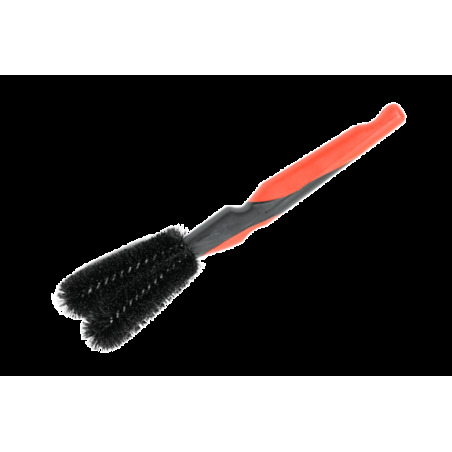 LARGE BRUSH Ideal for cleaning the chain and freewheel.SMALL BRUSH Perfect for derailleur and bearing.SCRAPER Scraper for an accurate cleaning of the free-wheel (compatible 8-9-10-11 gears).DUAL MATERIAL HANDLE Ergonomic and non-slippery. DUAL MATERIAL HANDLE Ergonomic and non-slippery.SOFT PARTS Do not scratch the frame.